See Iceland’s puffins, birds, and wildlife on a tight schedule with a 1-hour boat tour from Reykjavík’s Old Harbour. Ride across Faxaflói Bay in a custom-made RIB boat that’s designed for the best possible access without disturbing the birds that nest along the coast. Make your way to Old Harbour in Reykjavík, where you'll present this voucher for a bird watching tour. This tour is operated during the best months for spotting birds near Reykjavík, from May 15th to August 20th, and there are up to four departures each day. You’ll travel in a custom RIB boat—the Rigid-Hulled Inflatable Boats are the gold standard for fast trips on Faxaflói Bay, as the captain can shut off the engine in order to silently approach birds and wildlife. Watch for some of the 30,000 puffins that nest off the coast of Reykjavík, along with the flightless great auk, and gannets, the largest seabird in the North Atlantic. 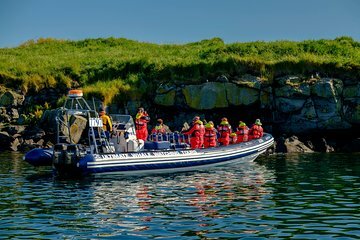 Throughout the tour, the guide and captain will share facts and stories about Iceland’s puffins, Faxaflói Bay, and any wildlife you spot along the way. This tour concludes back at the Old Harbor, close to the city’s attractions, restaurants, and sights.